In June, European XFEL hosted the 5th EIROforum School on Instrumentation. 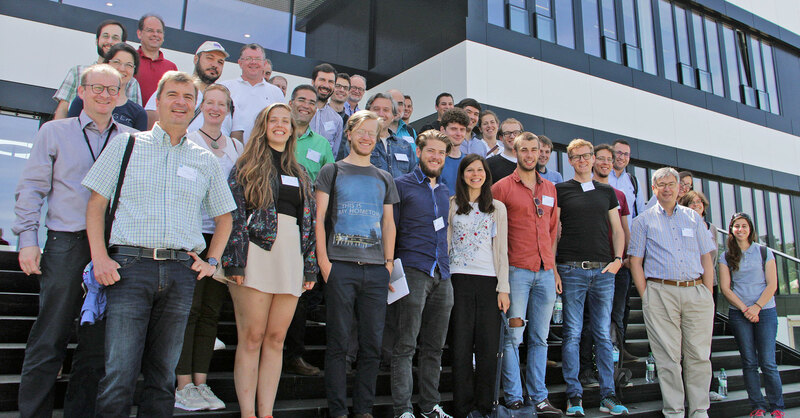 Over 35 young scientists and engineers took part in the five day event on the DESY and European XFEL sites aimed at giving the participants an overview of the basic and advanced principles of instrumentation, and hands-on experience of the values of interdisciplinary project work. The event included talks on instrumentation concepts from the fields of Free-Electron Lasers, synchrotron radiation, astronomy, space science, high energy physics, fusion, neutron science and molecular biology, with a highlight session focusing on gravitational waves. Speakers were scientists and engineers from across the eight EIROforum organisations. “We’ve had some truly fascinating and excellent talks and sessions,” said the chair of the Scientific Organising Committee and European XFEL Detector group leader Markus Kuster. “The talks showed me how I could use my competences in different organisations and research environments,” said course participant Nelly Hajizadeh, PhD student at EMBL in Hamburg. “That has been a real eye opener for me,” she added. A new feature this year was the project day developed together with the Aalto University Design Factory in Finland. “This is the first time we’ve tried something like this as part of this school,” explained Kuster. “The Design Factory fosters a collaborative and interdisciplinary working style to effectively transfer creative ideas into practice. Their extensive experience was really important in making the project day a success and the students benefitted from new and valuable insights into project work,” he added. In interdisciplinary teams, the participants were given the task of conceptually designing and building a prototype mock-up of their own within a time frame of six hours before pitching their business ideas and designs to a jury. Project briefs included how to grow Sicilian blood oranges in the humid continental climate of Montreal, how to find gold nuggets in the desert of Australia and how to measure the growth of grass in real time. “A lot of creative and fascinating ideas came together and we had a lot of fun!” said Kuster. “It was really wonderful to see how different areas of expertise can complement each other so powerfully,” said Hajizadeh whose research focuses on biological data processing. Participant Benjamin Rienäcker, a PhD student at CERN added, “as an experimental physicist I, for example, immediately focused on the realisation of the prototype for the grass growth-meter our team had come up with, including thinking about the overall process, working out what pumps and detectors we would need, as well as trying to anticipate the practical difficulties associated with the construction. Other members of our team focused on marketing strategies and data collection. As an interdisciplinary team we were much more effective since everybody contributed with their strongest discipline leaving no ‘blind spots’ during the project work.” “Working in interdisciplinary teams on projects such as instrumentation development is a very valuable experience, and I think everyone really appreciated this addition to the school – students and facilitators alike,” concluded local organising committee member Frédéric Le Pimpec. The next edition of the school will take place in 2019.